Gluten Free Savory Puris | Can't Believe It's Allergy Free! These colorful puris are excellent take-alongs. Make the dough the previous day and refrigerate it. Pull it out about 15 minutes before you plan to make the puris. They are quick, easy to make and great tasting. Pack them for a school lunch or carry on a journey. You might even find yourself rolling out a much larger quantity for the whole family. Add water slowly as you knead, making sure that the dough is not too soft. You may need to adjust the quantity of water. Knead the dough well. Smear a little oil on your hands to smoothen the dough as you knead. Good kneading will ensure smooth puris with no jagged edges. Divide dough into 10 balls or more if you want smaller puris. Place rice flour on a plate nearby. Place it on rolling surface, and using a rolling pin, roll into a small circle, a little thicker than chapati. It is not necessary to use plastic wrap for rolling out puris, the way I recommend for chapatis / rotis. Before beginning to roll out puris, place wok containing oil for frying on medium-high heat. Oil will heat as you roll out the puris. Test oil for readiness by dropping a small portion of dough into it. The dough should sizzle and rise to the surface. Move the slotted frying spoon along the edges, to cover puri with oil, and press puri slightly. Flip puri onto the reverse side. Fry for a few seconds till both sides are cooked and are golden brown in color. Remove from wok, holding it with slotted spoon along the edge of the wok to drain oil. Place on paper towel for excess oil to get absorbed. After all puris are done, place on serving platter. These puris will not balloon as much as plain puris,, because of the heaviness of the dough. Plain puris made with Grandma’s Gluten Free flour balloon as beautifully as wheat puris—try! Savory Puris do not necessarily need a vegetable accompaniment. 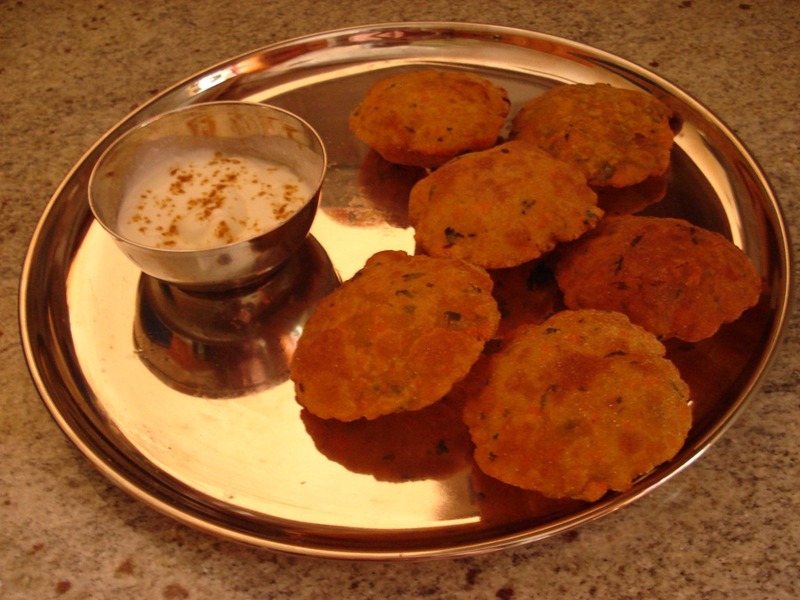 You could try these with a favorite chutney or raita. They are great just by themselves too!